Everyone’s talking about the newest ‘Game of Thrones’ (GOT) teaser trailer, which revealed the Season 8 premiere date and focused on the truth about Jon Snow’s identity. However, it’s not just who’s seen and heard in the teaser, but who isn’t that may play a role in Jon finally learning who his parents really are. 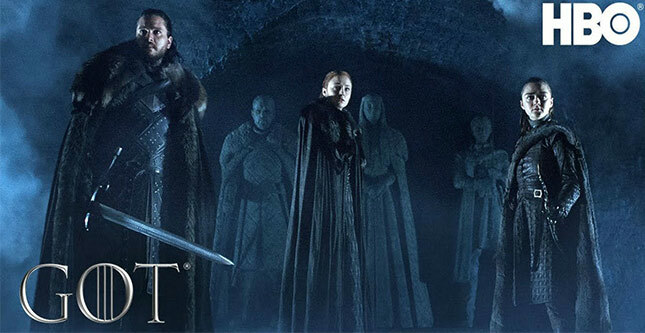 In the teaser, Jon, Sansa, and Arya walk by statues of dead family members in the crypts at Winterfell until they reach statues versions of themselves. As they do, we hear past quotes from Lyanna, Catelyn, and Ned Stark, all focused on Jon and his origins. Then, a frost approaches, presumably symbolizing the upcoming battle against the Army of the Dead. However, there’s one Stark missing from the teaser. Everyone’s wondering why Bran (now an all-seeing being known as the Three-Eyed-Raven) isn’t there with the rest of his siblings, but his absence could actually be a pretty huge clue about the role his character in Game of Thrones Season 8. Though Bran isn’t present in the teaser, everything seems to be pointing to his character being to one to tell Jon the truth about his parents. Bran did witness Jon’s birth. That could come into play when Jon finds out the truth in the final season. While no one involved with the show is sharing what will happen when Jon finds out he’s actually a Targaryen with a claim to the throne, the actor did offer a small clue. In an interview with TV Insider he admitted that it’s going to “be very hard for him.” After all, finding out the truth also means finding out that Daenerys is his aunt. There’s also the fact that the new Game of Thrones Season 8 teaser seems to suggest Jon, Sansa, and Arya will all die! In that case, Bran’s absence may be a subtle way to suggest that he may be immortal now that’s become the Three-Eyed Raven, or at the very least, that he’ll be one of the few characters to make it through the final season alive.